For current information about recreational access to all of Island Timberlands private forest lands, check the Island Timberlands web site. In late 2008, and with the help of its partners the Federation of Mountain Clubs of BC, the Alpine Club of Canada and the Hupacasath First Nation, the RDN achieved a long term license of occupation from the Province of BC over the Mount Arrowsmith Massif. 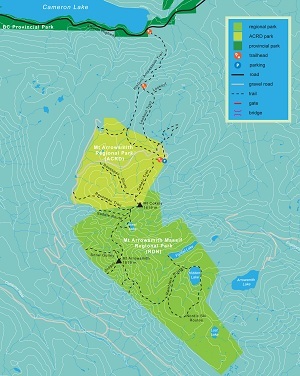 This new regional park covers over 1300 hectares of land and includes both Mount Arrowsmith and Mount Cokely. Mount Arrowsmith Massif’s alpine meadows are awash with flowers in the late spring and early summer. White tailed Ptarmigan live on the high ridges, and there is historical evidence of the Vancouver Island Marmot having habited the area. The Arrowsmith snow pack is key to the health of the Englishman and Little Qualicum, both important Vancouver Island salmon rivers and sources of drinking water. 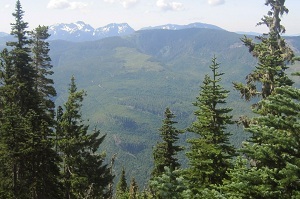 A network of long-standing alpine trails well serves the intermediate and experienced hiker heading up Mount Arrowsmith or Mount Cokely. Novices should consider guided hikes such as those offered through RDN Recreation and Parks in partnership with experienced local mountaineers. Weather conditions on the mountains can change rapidly at any time of year so take all due precautions every time you go up. For more information please see the park's Management Plan. Hiking, Nordic skiing, snow shoeing, ice and rock climbing. 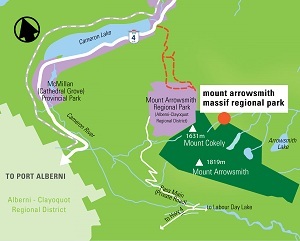 While the Regional Park is accessible by climbing Arrowsmith CPR Regional Trail and hiking through the Alberni-Clayoquot Regional District's Mount Arrowsmith Regional Park, most people will approach the mountain park via private logging roads and the trailheads off these roads. For information about using the private logging roads and trailheads, please Click Here.